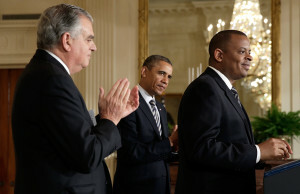 U.S. Transportation Secretary Anthony Foxx on Thursday said the government planned to recommend automatic braking systems be part of the New Car Assessment Program customer checklist. In a speech to the Society of Automotive Engineers, Foxx cited a new report finding that safety technology — and the vehicle standards ensuring it — has saved 614,000 lives from crash-related deaths from 1960 to 2012. He spoke of the government’s hope for a future without crashes. “We have a vision of America where driving on the roads is as risky as driving in one of those games in an arcade — where car crashes are as much a part of the past as horse-and-buggy accidents — and where everyone gets from A to B without visiting the ER in the middle,” Foxx said in his prepared remarks. That’s one of those sentiments collision repairers have to halfheartedly applaud. We’re all for zero injuries. But zero crashes impacts our ability to contribute to the auto-related job boom Foxx was also touting Thursday. However, it’s probably not really the end of the industry. According to IIHS’ Highway Loss Data Institute, these kind of systems don’t actually stop all crashes — though they seem to cut front-end collisions down by around 15 percent and make them less severe in nature (presumably to the occupants as well as the cars). The technology is also more expensive, and so the crashes you do work on could have a higher repair bill. According to Foxx, both crash-imminent braking and dynamic brake support would count. The first hits the brakes automatically if a crash looks likely and a driver isn’t braking. Dynamic brake support puts more pressure on the brakes if the driver isn’t hitting them hard enough to avoid a crash. The government is taking comments on the proposed rule for about two months. Find out how to submit one, more details about the government’s analysis, and what they’re most interested in hearing about here. Correction: This article had erroneously stated that the government had proposed automatic braking be part of the five-star safety rating; the government recommended that it be included in the recommendations accompanying that rating. The article has been corrected.